The ACC-PS1 is an economical, single channel, high performance accelerometer power. It operates from two standard 9 volt batteries and includes a built in battery test meter. 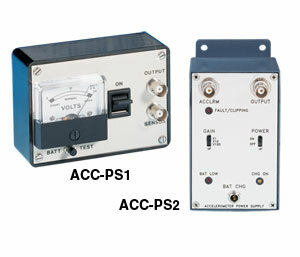 The model ACC-PS2 is a rechargeable battery powered, single channel, high performance accelerometer power supply/amplifier. This miniature low noise power supply features a Ni-Cad battery with detachable charger, 3- position gain (for amplification of x1, x10, x100), LED low battery indicator, over limit (clipping) indicator and fault indicator. This power supply has a rugged aluminum housing with four easily accessible mounting holes on 4.75 x 1.75" (121 x 44 mm) centers. Battery charger is included.